Shakespeare was just nineteen years old when he first became a father: his daughter, Susanna, was born in 1583. His twins, Judith and Hamnet, arrived two years later in 1585. Shakespeare then left for London where, a few years later, he began writing plays for the theatre. He spent most of his time in London during the early years of his children’s growing up, but he went home often – sometimes for a few months at a time. Shakespeare’s wife Anne was left to raise the children on a day-to-day basis but William was nevertheless the husband, father and head of the family and the home. 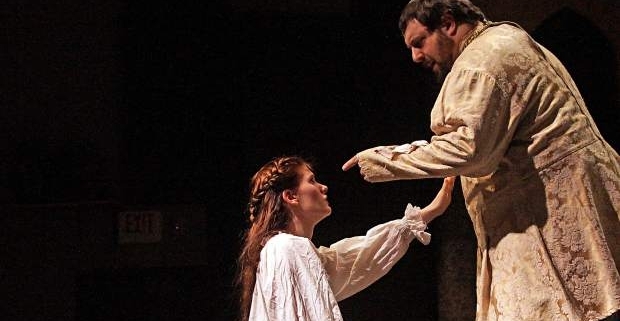 We know nothing about Shakespeare’s relationship with his children but it is interesting that so many of his earliest plays have, at their heart, the relationship between fathers and their daughters. When Judith was thirteen he produced The Merchant of Venice and A Midsummer Night’s Dream, both exploring the emotions and decisions of rebellious daughters, leaving fathers raising their hands in despair. But when Judith Shakespeare was just fourteen her father wrote a play, Romeo and Juliet, in which a daughter, fourteen years old, just coming to marriageable age, defies an enraged father who swears at her, threatens her, and insists on her obedience. The question is: how did Shakespeare have such a deep insight into fourteen-year-old female passion? Could his Judith have been a model for that? We will never know, but any father with a fourteen-year-old daughter knows what a rough road it can be! In all three plays the issue is who the daughters should marry. The fathers assume that they have the sole right to decide – to ‘give’ their daughters away, which in Shakespeare’s time usually meant sell rather than give. But Shakespeare is observing, imagining, creating – whatever his genius mind is doing – the modern young Western woman we recognise today: the woman who could not marry a man who repulsed her, or with whom she wasn’t in love. In the modern Western world a woman falls in love and wants to spend her time with him and make a life with him because of her feelings towards him. There are exceptions of course but this is the general pattern. In The Merchant of Venice, A Midsummer Night’s Dream and Romeo and Juliet all three women are modern in that sense and the fathers are rendered impotent by this powerful drive in their daughters. In The Merchant of Venice the observant Jew, Shylock, locks his daughter up but she escapes through a window, climbs down a ladder and is whisked away in a gondola by her Christian lover. In A Midsummer Night’s Dream the outraged father appeals to the Duke to try and get his daughter, in love with a young man without prospects, to marry the wealthy man he has promised her to. She also runs away. But it is in Romeo and Juliet that Shakespeare really gets into this theme and we have close-ups of the father’s frustration and his distress as his dream of ennobling his grandchildren through the marriage he has procured comes tumbling around his ears. Shakespeare never lost his keen interest in this theme and plays like Othello, with Brabantio’s anger at his daughter’s decision to marry a black man, explore it anew. King Lear is about a lot of things but it is basically a family play, about fathers and their children, but in Lear’s case, it is about an autocratic old man and his three daughters. The theme is thoroughly explored and we see that by this time Shakespeare has a mature and complex view of this fundamental human phenomenon. And we see the terrible consequences of a father’s unreasonable demands. Judith’s first child was born in 1608, making Shakespeare a grandfather. It was a daughter. And is it a co-incidence that in the following year three plays – Pericles, A Winter’s Tale and The Tempest flowed from her grandfather’s pen that portray an old men stuck in a stale, corrupt world refreshed and redeemed by an innocent and fresh young girl? The girls are all very young, and untainted by the sophisticated world their fathers inhabited. In The Tempest Miranda has grown from a baby to a beautiful fifteen-year-old without ever having even seen a man, apart from her elderly father. 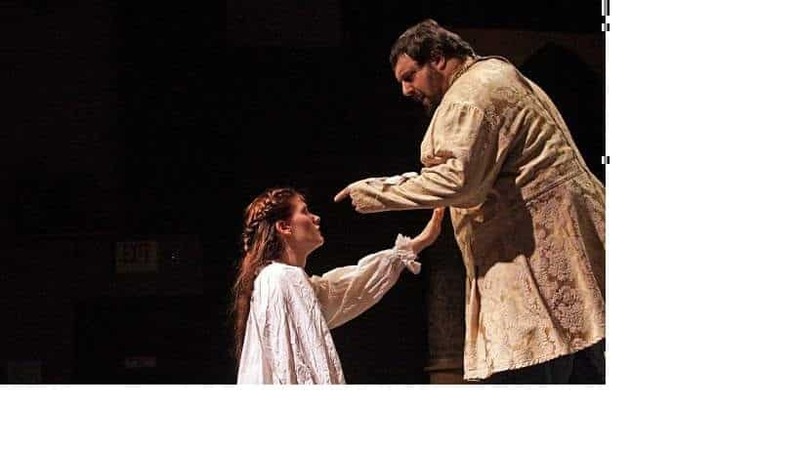 In this case, now, although her father, Prospero, still controls her every movement, he steers her towards Ferdinand, with whom she falls in love. Throughout the process Prospero piles his blessings on to the couple, even though Ferdinand is the son of his enemy. The themes in Shakespeare’s plays are multiple – all packed with wisdom and lessons for life. It’s impossible to relate all of that to the facts of his life as we know them but thinking about plays written in response to the most intense of life’s experience, the birth of children and raising them, is irresistible, and wasn’t the genius, William Shakespeare, human after all?